Former Uzbek warlord Abdul Rashid Dostum narrowly escaped the suicide bomb attack after returning to the country from the cold after facing allegations of torturing and abusing a political rival. The bomber detonated his suicide jacket at a celebration held to receive the vice president, the militant group said in its claim of responsibility issued through its self-styled news agency, Amaq. It gave no further details. Mr Dostum’s charter plane landed in Kabul late Sunday afternoon, where he was received by several Afghan officials, including Second Vice President Sarwar Danish, and a massive crowd of supporters in and around the airport. Interior Ministry spokesman Najib Danish said that 14 people, including both civilians and military forces, were killed in the attack and 50 others wounded. The victims included an AFP news agency employee. 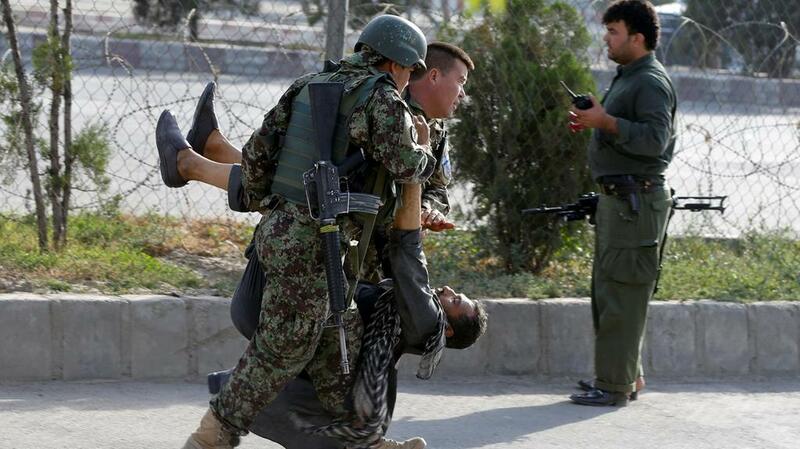 This is the second AFP employee to have been killed in an attack in Kabul this year. An eyewitness, an official close to Gen Dostum who was at the airport to receive the vice president, described seeing several bodies on the street outside the airport and said that the explosion had ruined the spirit of the day.